I like milk glass. Like I mentioned in an earlier post, my Grammy collected many pretty pieces. They were beautiful, sentimental and really helped set the mood at our wedding. The cake plates, vases and cups now decorate my home. When it came time to pick out my dining room, I decided to stick with the theme. 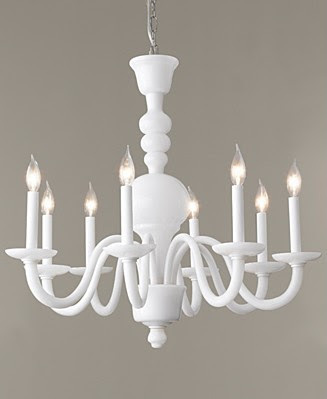 I purchased my chandelier from Macy's via Martha Stewart Lighting and it is no longer available :( I love, love, love the shape, the glass, and the warm glow in my dining room. Jake's mom made us new window treatments and I am getting ready to wallpaper, so more before and after photos of our home to come! 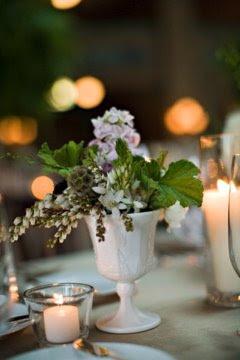 Do you have plans to/did you reuse pieces from your wedding in your home? that chandelier is so beautiful- i've never seen anything like it! 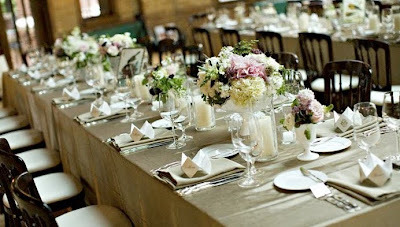 Yep,the milk glass really did help to set the elegant mood for the wedding.Love the table setting and the decors.Nice touch! I love the chandelier. Why did they discontinue it? We purchased antique vases that we used in our wedding. They are now in my antique china cabinet.